I lightly retouch all my portrait images. I lighting smooth skin, brighten and color correct. This helps give portraits a professionally finish. After adjusting my white balance and exposure of an image I then use our Retouching Photoshop Actions. Did you know you can fully retouch portraits in Lightroom?? Lightroom has some amazing tools to help you retouch your portraits. Lightroom Brushes can smooth, brighten, adjust skin tones, sharpen, darken, saturate, soften and so much more. We offer a wide range of Photoshop and Lightroom Retouching Presets and Actions. 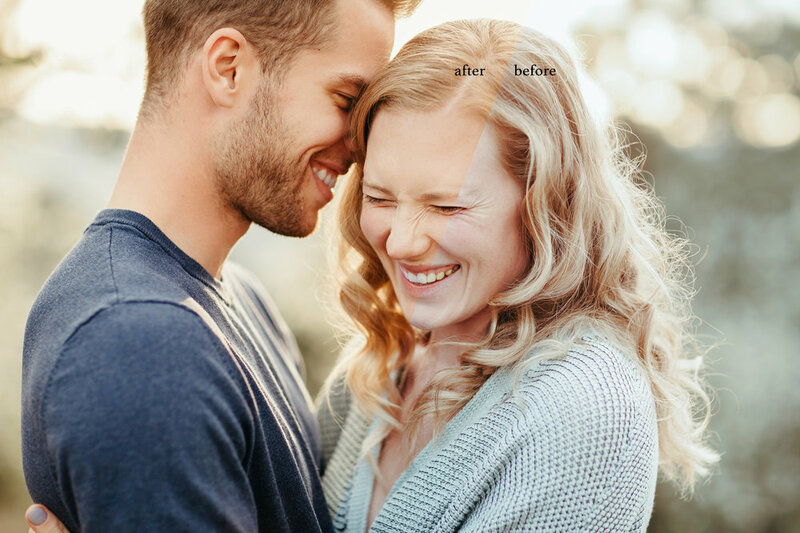 They offer a soft subtle retouching effect to your images. You can change the opacity of the actions to make them even softer or play the action again for a more dramatic edit. These are a staple for Portrait/Wedding Photographer workflow. Not all clients will want their portraits enhanced but you will get a handful of clients that want minor editing done to their skin. Our products offer just that. They won't make your clients look like different people but will take care of the minor skin issues your clients might have.